The logo for the anime series. 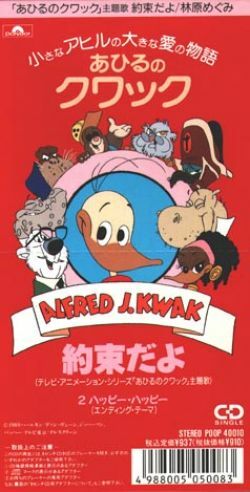 Alfred J. Kwak is a Dutch-German-Japanese animated comedy-drama TV series based on a Dutch theatre show by Herman van Veen and was co-produced by VARA, Telecable Benelux B.V., ZDF and TV Tokyo. The show was released in 1989. It consists of 52 episodes. Despite the fact that it was animated in Japan, the only home media related to this anime that was released in Japan was a music CD with show's theme song sang by Megumi Hayashibara. This made the Japanese dub much more rare than any European version of the show, considering there were several DVD's and VHS's produced in some European countries with respectful dub of country in question. On October 13th, 2008, YouTube user 6satan6lucifer6 uploaded the Japanese opening of Alfred J. Kwak, which seems to be TVRip, proving that recordings out of there clearly existed. In the comment section of the video, YouTube user OldClassicGamer asked if it's possible to find episodes of the show in Japanese. One of the answers stated that a long time ago, someone uploaded all episodes in Japanese on YouTube in the past, but it seems like they were removed at some point, most likely due to the copyright claims. Nevertheless, the user did say he had some episodes saved before they were removed thus sending OldClassicGamer 32 out of 52 episodes with a Japanese dub. Given the copyright law in Japan, it is likely possible that quite a few Japanese people have this anime recorded in their private collection, but cannot be uploaded it due to constant internet monitoring. Unless someone comes forward and says they managed to save all episodes while they were on YouTube, chances of this dub being found are quite low. The opening to Alfred J. Kwak.